S.L.Packaging Pvt. Ltd. is one of the leading manufacturer exporters of wide range of Jute & Cotton Products. Each Footwear is hand stitched to jute bottoms and adjust to your feet. We have footwear for all ages, kids, men and women. You can have in cotton plain color or Stripes & Floral printed or embroidered or in colorful stripe or in silk. Whatever is your style, we can fulfil your need. Outsole can be Straight or Left & Right. Rubber can be transparent, color full or beige color, which ever suites you best. An iconic roller buckle secures the ankle strap atop a fashionable espadrille wedge updated with a sporty, street-smart rubber sole. 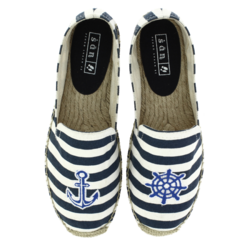 Flaunt an effortless look of Anchor & Wheel with this pair of spanish espadrilles from SAN. A must-have in your footwear collection these shoes feature a sleek look with jute detailing. Club these with tapered chinos and a trendy shirt. 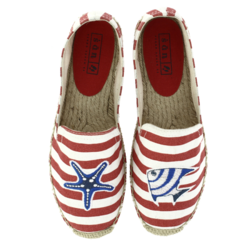 Flaunt an effortless look of Aquatic with this pair of spanish espadrilles from SAN. A must-have in your footwear collection these shoes feature a sleek look with jute detailing. Club these with tapered chinos and a trendy shirt. 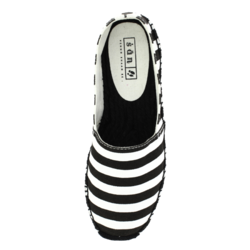 Flaunt an effortless look of Halloween Theme with this pair of spanish espadrilles from SAN. A must-have in your footwear collection these shoes feature a sleek look with jute detailing. Club these with tapered chinos and a trendy shirt. 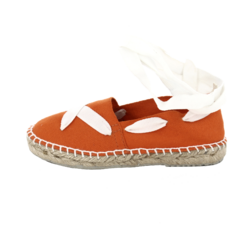 SAN kids original espadrille is a staple of every endless summer. The sole is made of natural, eco friendly jute that keeps little feet cool and dry. Elastic reinforcements at the side to make slipping it on, easy. Whether on the beach, in the garden, or off on an adventure, we think they are the perfect throw-on summer shoe for kids. 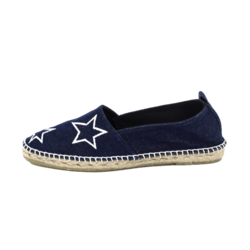 Made from 100% cotton, with a jute inner and a natural rubber outer sole, they will be comfortable enough for children to wear all day long – ideal for the fast approaching summer holidays. Jute flat canvas espadrilles for kids traditionally hand crafted .The sole of the espadrilles are made of jute thread and recycled textile fibers. The cotton canvas is manually hand stitched to the sole, the loop and laces are optionally removable. Ankle tie laces. Perfectly crafted for urban streets, these colorblock espadrilles are made for rough use. Pair them for all the street fun and your feet will always be happy, thanks to the jute insole which keeps your feet fresh and happy, absorbing the sweat keeping your feet odour freePair them with our grey cuff jogger sweatpants and popover hoodies for the perfect street look. These handmade nautical stripes are a great pick for making a contemporary statement . 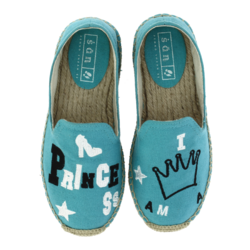 Made from 100 % Canvas with cushioned insole, it ensures that the feet are comfortable and sweat free all throughout the. Finished off with Jute lining stitched to perfection and a cushioned branded outsole. The sturdy yet soft comfort of denim gives your feet a whole new different level of ease . Denim gets a fresh twist to that 80's America Look . The smooth fabric inner lining , rubber sole and finishing with PU binding makes these a show stopper of your casual urban wardrobe . Pair these with cotton chino pants or shorts to compliment the look !